NPC recently spoke with B2B media publicity and promotion expert consultant Steve Campbell of Campbell & Company Strategies Inc. The question: How can companies optimize the major dollars they invest to participate in industry tradeshows? One of the most important of these strategies is to leverage a booth presence by maximizing the many free publicity opportunities available to tradeshow exhibitors. And, Campbell notes, there are plenty of ways to do this. The key to taking advantage of them is to start early in the planning process. The first chance to get in on a gold-plated promotional opportunity, says Campbell, comes when you first deal with a sales rep about exhibiting. Inquire whether there are unpaid speaking opportunities for interesting technologies in the tradeshow (or accompanying conference); regardless of the answer, you can pursue these on your own. According to Campbell, who works with Canadian natural products companies such as NPC client, Mazza Innovation, “What makes these speaking opportunities so attractive is that high-value targets will come to hear you speak simply because they must keep on top of new emerging, disruptive technologies and companies. They need to know what’s coming up that might help their business and also who they might do a deal with.” Attendance at one client’s presentation at a recent tradeshow in Geneva included a 5-star partner prospect they might never have met otherwise. Campbell says companies should contact the tradeshow speaking organizer quite a few months ahead of time and be ready to submit a succinct but engaging topic “sell piece” that will interest both the decision-maker and, ultimately, tradeshow attendees. This may include explaining one of your technological advances that participants will want to hear about. While there may also be paid speaking opportunities, Campbell says it’s best to focus on the low-cost/non-paid ones first. If they tell you the conference agenda is already full, ask to be put on the waiting list; speakers sometimes cancel and openings can occur at the last minute. 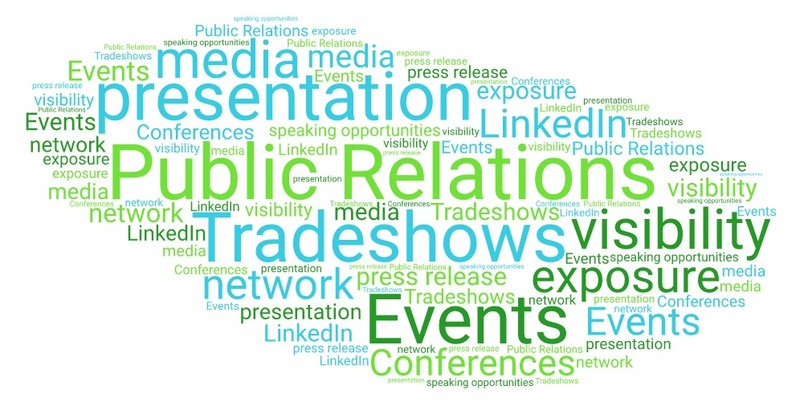 If you do get a presentation opportunity, issue a news release on the topic and send it to both the tradeshow’s PR staff and any trade magazine or newsletter editors attending the show. This might get your presentation written up, or encourage attendance or subsequent interviews. One other way to publicize the opportunity is to post it on your LinkedIn account. Campbell recommends building up LinkedIn contacts with plenty of industry players and customers. Taken together, your senior managers’ LinkedIn contacts can form a circulation list for your own industry-specific newsletter. His recommendation: have your senior managers make it their mission to greatly expand their LinkedIn contacts. 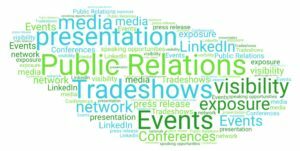 Another way to publicize your company’s presence in advance is to provide the tradeshow’s PR staff with an engaging written article about your company, complete with an “angle” focused on an industry challenge that your technology addresses. If you’re a start up, you can also apply for the show’s various awards, as many tradeshows will have a startup showcase competition. One client won a booth at the next year’s event — that was definitely worth the effort. New product announcements and launches are important, and trade shows are one place you will want to showcase new products. Campbell notes this should be backed up by written new product releases and graphics/photos distributed to all trade magazine writers and editors attending the tradeshow. Send these in advance to pique editors’ interest and encourage them to schedule a visit to your booth. And remember: these need to be written in a format that makes for easy publication. Editors have new product announcements coming across their desks all the time, so those that are print-ready will get published ahead of the ones that require significant editing. Campbell also suggests you send out pre-show invitations to trade media editors, reporters and analysts to visit your booth or interview you on your new products or advanced technologies. Give them a good reason to drop by: usually it’s an impressive new product or technology announcement, or an opportunity for them to hear from your CEO about innovations affecting your industry. Even if they don’t have time to attend, they’ll appreciate the invitation and it might encourage them to get in touch with you later. It’s a question worth asking: why put in this much effort for free publicity? “Because it’s the best and lowest-cost way of leveraging your tradeshow investment. It definitely beats the alternative of buying expensive promotional ads in the tradeshow program or sponsorships that can end up costing as much as or more than your booth.” Campbell adds that while tradeshows are often priced in U.S. dollars or euros, the bonus is that your advance work — conducted in the office — is performed in Canadian funds. Finally, you’re applying hard-earned corporate and product development knowledge that you’ve already spent a lot of money and time creating. Leverage both of these to the max and you’ll increase the value of your next tradeshow expenditure. QUESTIONS? If you have questions about how to make the most of your tradeshow experience, or anything else to help you grow your natural product business, please contact us.